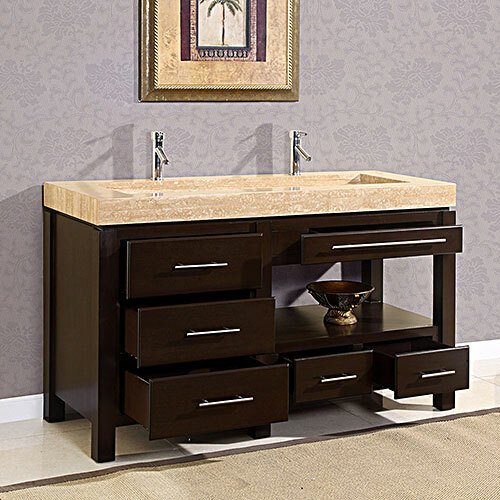 The Espresso finished cabinet of the 60" Gavius Double Sink Vanity puts together elegance with durability for a vanity that's truly a remarkable sight to see. Its cabinet offers six fully-functional drawers interspersed around a side shelf that gives you various places for storing your bathroom necessities. 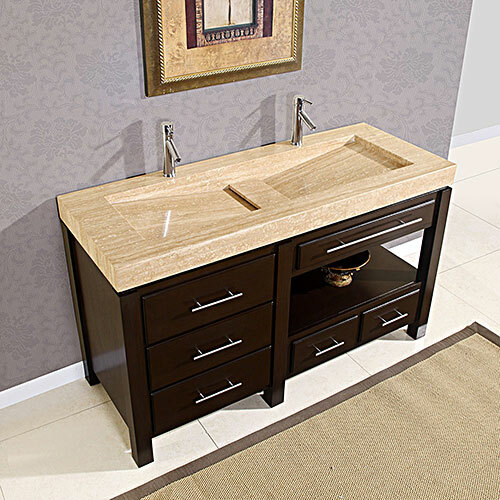 Its gorgeous integrated Roman Vein-Cut Travertine top and sinks are integrated into one large unit to give it a solid, flowing appeal, from which its handsome appeal stems. Each sink has a pre-drilled faucet hole for easy faucet installation, while all the drawers are equipped with soft-closing glides for durability that will last years to come. Faucets are sold separately.